Winning Group 2013 JJ Giltinan 18ft Skiff Championship, Race 4. 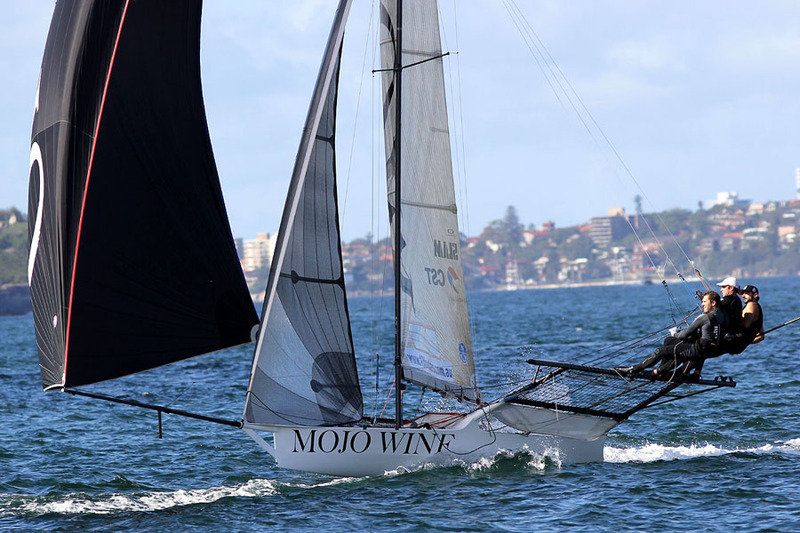 A three-way battle to win the Winning Group 2013 JJ Giltinan 18ft Skiff Championship hotted up even further today on Sydney Harbour when Thurlow Fisher Lawyers scored and all the way win in Race 4. Michael Coxon, Trent Barnabas and Dave O’Connor bounced back after a horror day in Race 3 yesterday, when they were forced to retire with a broken bobstay. 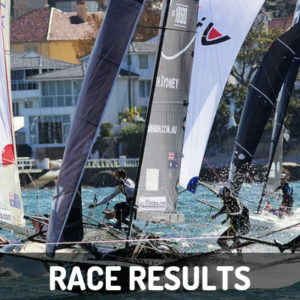 Thurlow Fisher Lawyers grabbed the lead on the long beat into Rose Bay before racing away to score a commanding1m36s victory over New Zealanders Alex Vallings, Josh McCormack and Peter Burling in C-Tech. The race for third placing produced an amazing finish with three skiffs crossing the finish line only 2s apart. Smeg (Nick Press, Dan Phillips, Dave Ewings) got the verdict, 1s ahead of Gotta Love It 7 (Seve Jarvin), which was a further 1s ahead of Pure Blonde (Tom Clout). After each skiff discards her worst performance to date, Gotta Love It 7 holds the lead on 4 points, followed by Thurlow Fisher Lawyers on 6, Coopers-Rag & Famish Hotel (Jack Macartney) on 7 and C-Tech on 11. 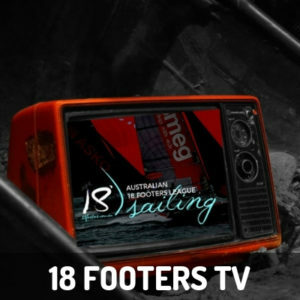 With some strong southerly winds predicted over the coming days, there will be great racing between the top teams as they strive for the elusive title of the best 18ft Skiff team in the world. Today’s race was sailed in an ESE breeze below 10-knots, with many shifts in direction and variations in strength. 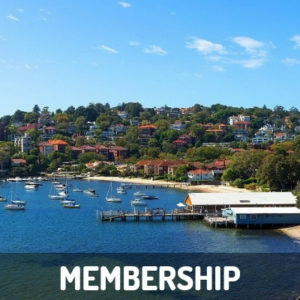 Thurlow Fisher Lawyers held a 10s lead over Gotta Love It 7 at the first windward mark in Rose Bay, but extended this to 50s after the long spinnaker run to Kurraba Point. This was a poor leg for Gotta Love It 7, which fell back behind Smeg and C-Tech and was now 1m25s behind the leader. Pure Blonde made a spectacular challenge down this leg to be in fifth place and closing on the group behind Thurlow Fisher. 7 made another ‘comeback’ into second place at the next windward mark (although still 1m20s behind Thurlow Fisher), but once more lost time on the spinnaker run. The third work to Rose Bay didn’t change the leading positions as Thurlow Fisher headed for home with a clear lead over C-Tech, with Smeg and Pure Blonde close together and Gotta Love It 7 back in fifth place. As the breeze swung a little more to the south, most crews were forced to drop their spinnakers to make the finish line while the ‘7’ crew carried there spinnaker to create the exciting three-way finish for third place. Today’s result sheet and eleven photos are attached. 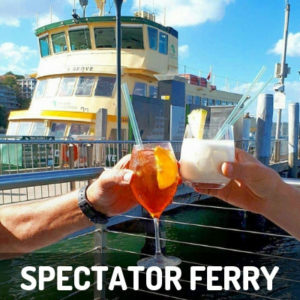 Spectator ferries will follow each of the races in the championship but intending spectators should note that tomorrow’s race will start at 2pm to avoid large harbour traffic scheduled for later in the afternoon.